My sourdough culture, Tom Crumb. Naming your culture is a tradition among sourdough bakers. Having met the four Tom’s in my research group, I felt like I needed a fifth. As I mentioned in my post on steak and ale pie, my lack of brewing has left me more restless than usual for culinary challenge and adventure. While I was brewing, my interest in fermented foods expanded, but I kept pushing projects like kimchee, yogurt, and sourdough to the back of my mind. A fellow homebrewer offered me a kombucha mother and I let the opportunity slip away during the holidays. No more! I’ve grown a sourdough starter, and I’m not looking back. My first sourdough loaf, and one of the best loaves of bread I’ve ever baked. It couldn’t have been easier to start, but since sourdough is a living colony of organisms it does require regular feeding. 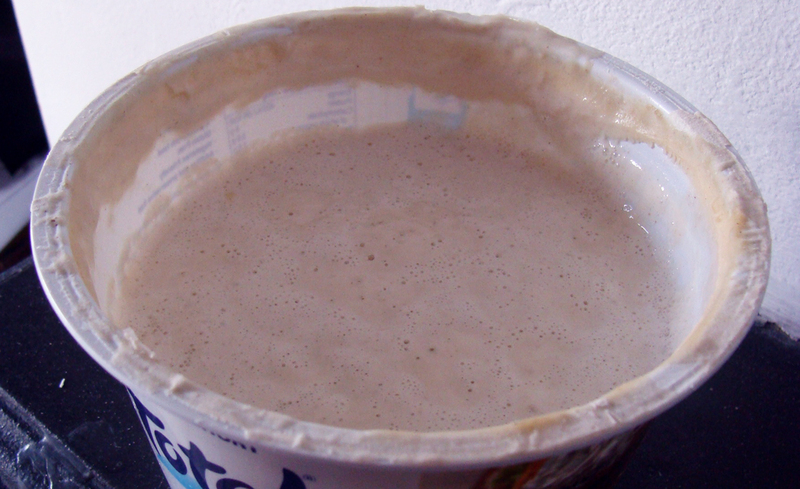 Of course, feeding your starter causes it to grow, and if you’re uncomfortable with the idea of tossing perfectly good starter (as I am) then you’ll have to commit to either a regular schedule of baking or plan ahead to prepare your starter for storage and revival every time you want to use it. 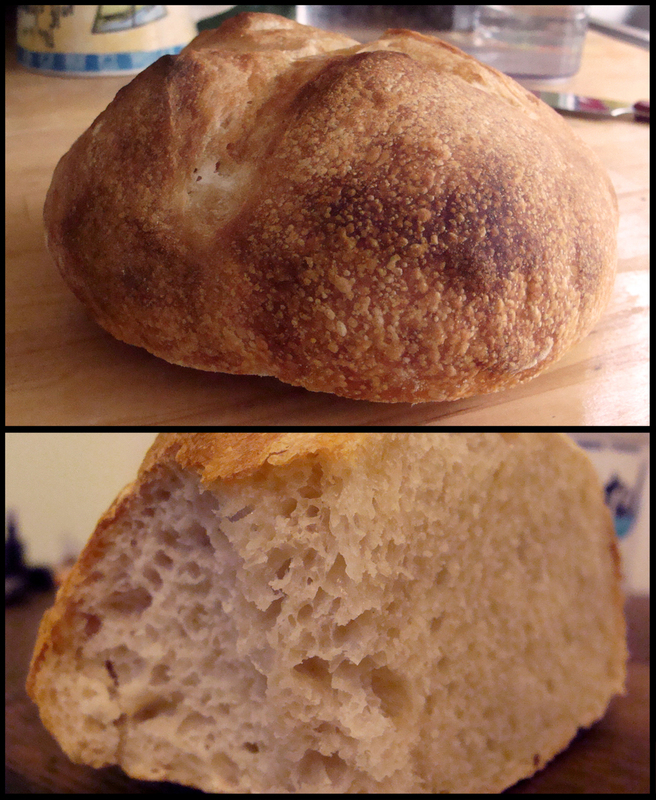 Since Jim Lahey’s no-knead technique has convinced me to bake bread much more often (my aspiration is to no longer need to buy bread), my major concern in caring for my starter was eliminated. I grew my starter following Serious Eats’ starter-along guide, but found that many pizza enthusiasts make use of a commercially available culture from the island of Ischia in Italy. When I return to the States I may buy the Ischia colony, and perhaps the San Francisco colony as well, but for now my primary interest is in working with wild yeast and bacteria. If you’re curious to get started yourself, I would recommend the ease of the Serious Eats guide or sending away for this free sourdough starter which was brought along the Oregon Trail in 1847. 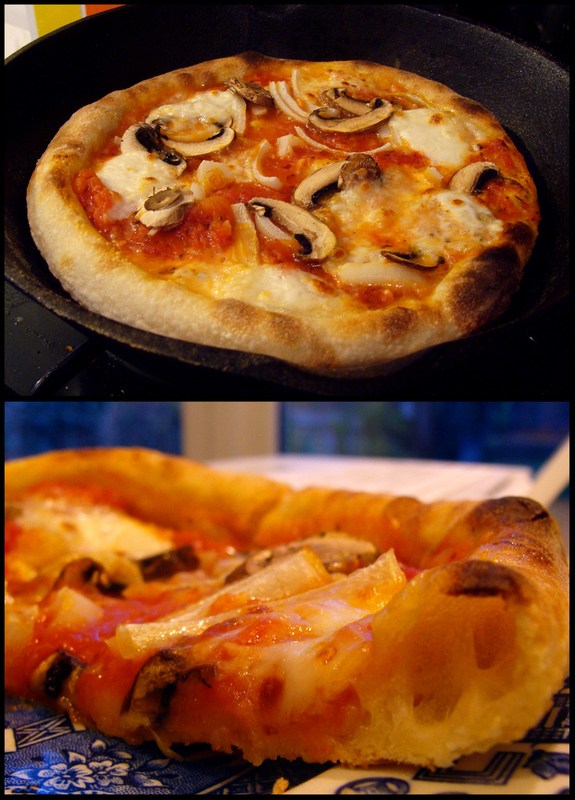 A pizza made with sourdough culture and whey. It is absolutely worth maintaining a sourdough culture if you are regularly baking. Feeding the culture is easily incorporated into a routine, especially if you’re already handling flour or dough every day or two. The result is bread that is much richer in flavor and aligns more closely with my ideal of bread, delicious enough that I have at times failed to resist scarfing down a whole freshly baked loaf. Even in pizza crust the culture adds a noticeable and pleasant tang that can make a crust stand out amongst the strong flavors of the sauce and cheese. So far my best results have been with white flour. Incorporating oats or wholemeal flour into the dough have seemingly diminished the flavor of the sourdough, though it’s still a noticeable element in those breads. This runs somewhat counter to suggestions I’ve read that feeding a culture wholemeal or rye flour can evoke a more robust flavor from the microbes. I haven’t tried feeding my culture anything other than white flour yet, because my pizza and bread always includes some portion of white flour as a base, but I am curious in particular to try out rye flour. Dovetailing with an attempt at fermenting sauerkraut, I will hopefully end up with delicious reuben sandwiches and perhaps even a reuben pizza. 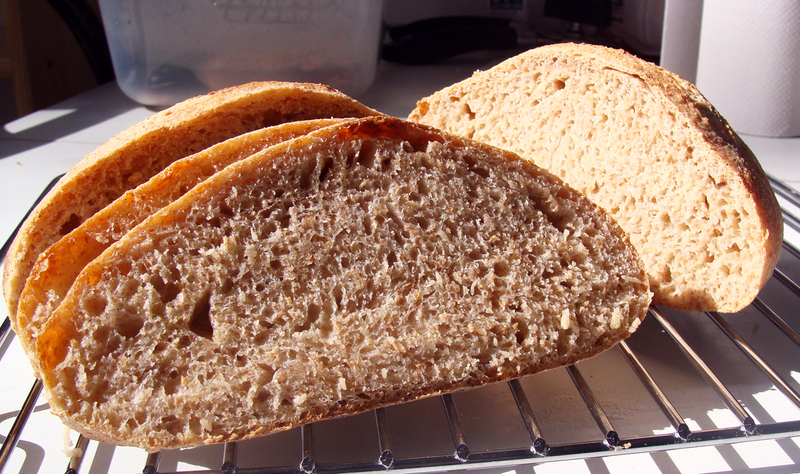 Sourdough bread made with one quarter wholemeal flour. I’m still a bit of a novice with using sourdough culture, so I haven’t done much exploring with fermentation times, cold fermentations, or even how much of the final dough mass is made from the culture (I’ve been working between about 15–30% based on recipes linked from the Serious Eats sourdough guide). Experiments on this will probably have to wait until I return to New York where I have more control over the variables at play in the kitchen. Since dried yeast thoroughly dominates home baking in the US, most of the reading I’ve done on baking makes no mention of sourdough, so more digging on the research end is also required. As a concluding note, I want to share a photo that my dad sent to me a few weeks ago. I made pizza for my dad months ago and he had asked me to teach him. I made videos on making dough and stretching the dough, and sent him some emails and texts to answer more specific questions he had. He’s been practicing and has gone from cracking his stone on his first attempt to turning out a pie that’s as beautiful as anything I’ve ever made. I am filled with pride at his pizza accomplishment. 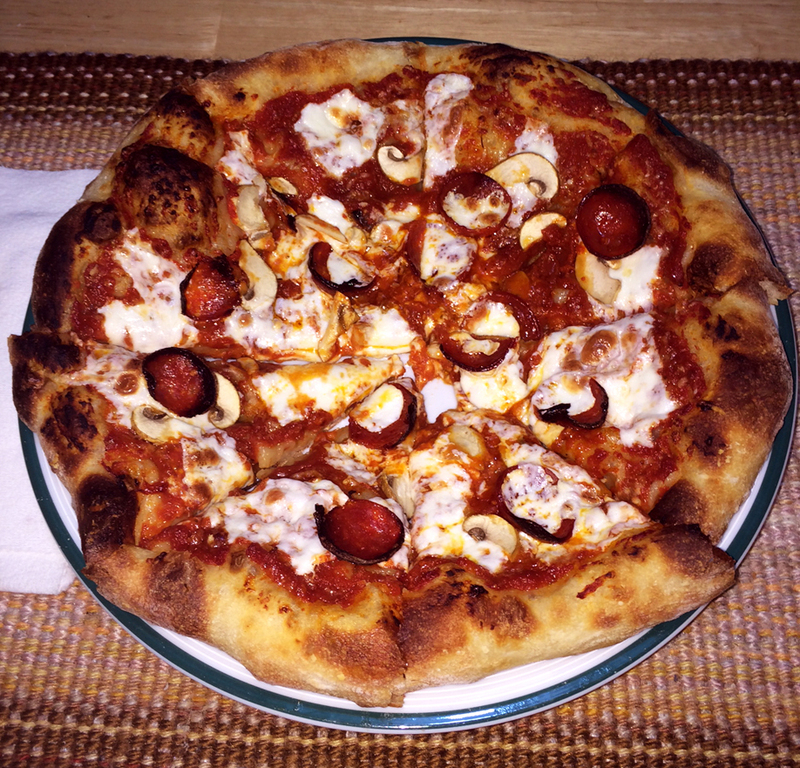 This entry was posted in learning, pizza and tagged acetobacter, bacteria, bread, dough, fermentation, fermented food, flour, lactobacillus, oats, sourdough, whole wheat, wild yeast on March 23, 2014 by Dylan Bargteil.